Hewitt spent 22 of his 30 years at the University in the Department of Intercollegiate Athletics. He started his career as assistant director of intercollegiate athletics in July 1989. He served in several roles outside athletics from 1995 through 2002, including interim vice chancellor for development and public affairs, as well as two stints as interim director of alumni services before returning to athletics in 2002. Outside athletics, Hewitt helped secure funding and led the SIUE Foundation in the construction of Birger Hall. Hewitt guided SIUE through the transition to Division I athletics under Chancellor Vaughn Vandegrift, PhD. 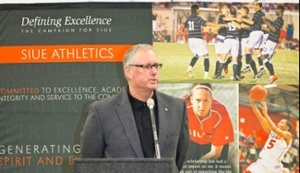 Hewitt orchestrated the expansion and development of seven facilities on the SIUE campus to assure the program’s competitiveness and the eventual move to Division I. During his tenure, the program saw the addition of, and several renovations to, Korte Stadium, benefitting soccer, and track and field programs. Additionally, Hewitt led the expansion of the baseball, softball and wrestling facilities, as well as improvements to the Vadalabene Center, its administrative offices and student-athlete program support facilities.